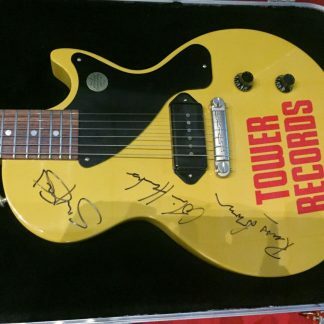 This one-of-a kind “Tower Records” Gibson Les Paul Jr. Electric Guitar is signed by Tower Records founder Russ Solomon, and Colin Hanks and Sean Stewart, the filmmakers of the Tower Records biopic “All Things Must Pass.”The guitar was donated by Gibson to auction for the benefit of the Tower Records Project, an effort to preserve the legacy of Tower Records. Russ Solomon attended the April 2015 Sacramento premiere of “All Things Must Pass” and the auction. Solomon died March 4, 2018. 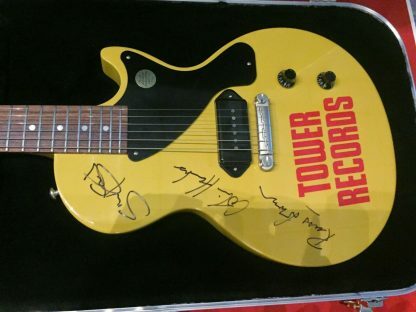 The guitar features a custom “TOWER” embossed truss rod cover and Tower Records logo on the guitar body. The guitar is basically unplayed. 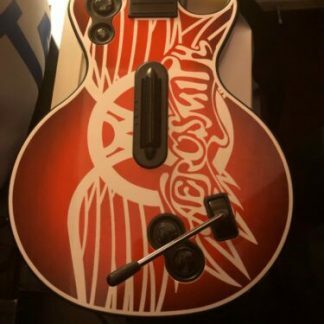 It still has the plastic covering on the pick guard. 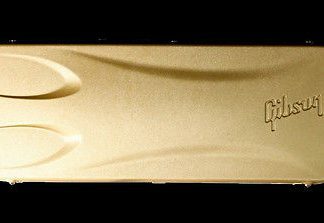 It has remained in its original Gibson hardshell case in a smoke-free home by original owner since purchase at April 2015 auction. GForce charging cable included along with all original case candy.Features:Custom “TOWER” embossed truss rod coverSigned by Russ Soloman, Colin Hanks, Sean StuartTower Records logoMahogany body22-fret Mahogany neckRosewood fingerboardSingle Gibson P-90 pickupMaster volume and tone controlsWraparound bridgeBrass nutG-Force tunersNitrocellulose Lacquer finishMade in USA Condition is New. Shipped with USPS Priority Mail. 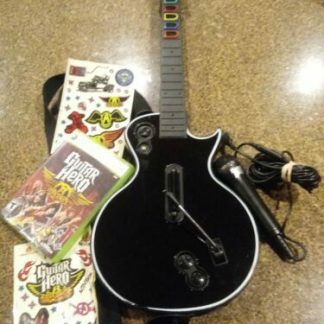 Xbox 360 Les Paul Gibson Wireless Guitar Hero Aero Smith Bundle (no dongle) Guitar Hero Les Paul Aerosmith Gibson Guitar For PlayStation 3 Guitar Only!